There are many ways a Boston bike crash involving a car can occur. One of the more common ways involves cyclists in the extreme right lane, alongside a line of cars, with a car making a right turn. The problem is, many motorists don’t look for or see the cyclist and the result is a collision. 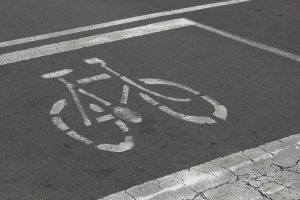 The National Law Review recently published an article about right turn bicycle accident lawsuits (we prefer to the term “crash,” though we know many people still commonly call them “accidents”). This type of bike crash is getting more common in Boston and cities across the nation as more and more people are using bikes as a primary mode of transportation including traveling to and from work. According to the League of American Bicyclists, there is no question that biking as a means of commuting is getting more popular as time goes by. This organization compiles various study results and keeps detailed statistics of how many people use bike riding as a primary means of commuting. One way to measure the data is in terms of how many bicycles trips (not recreational use) are taken each year. In 2001, there were 1.7 billion trips and by 2009, there were 4 billion trips. This number is only continuing to increase as more time passes. As our Boston bike crash lawyers can explain, while bike accidents involving a turning car at red light that does not see a bike rider stopped to the right of them are very common, there are other types of right hand turn bike crashes. In some cases a car is approaching an intersection where there is a green light, or no light at all and does not see slower moving bike rider traveling in the extreme right lane. As the car turns, it crashes into the bike, and since both vehicles are moving, the damage is even more substantial. These cases often involve larger trucks such as box trucks, moving vans, semi-tractor trailers, or even city buses. These vehicles have many more blind spots, but that doesn’t mean the driver is not negligent. There are various mirrors on trucks and buses including convex mirrors to give the driver a greater field of view. Additionally, the driver is supposed to be looking ahead so that if he or he passes a bike rider, they should be aware the bike rider is in their blind spot. There is no question that it takes a greater level of skill to drive a large commercial vehicle, but that is why there is more training required, a much more difficult written test, and the need to obtain a commercial driver’s license. However, with this CDL, there is a standard of care to act as a reasonable and prudent truck driver in preventing foreseeable injuries to foreseeable persons and property . This is similar to the standard of care in an ordinary car accident lawsuit, but the driver will be held to the standard of reasonable and prudent truck driver instead of the driver of a passenger car. This is fair because the driver chose to drive a commercial motor vehicle as part of his or her employment and must accept this higher standard of care. There are also the standard types of negligence that cause these serious and sometimes fatal Boston bike crashes. For example, if a driver of a commercial motor, or any vehicle for that matter, is distracting by playing with his or her smartphone, this would be an act of negligence and that driver should be held responsible for the consequences associated with the act of negligence. As discussed in this article, failing to use a turn signal is not only an example of negligence, but is one of the main reasons these types of accidents occur. While the bike rider may have right of way, the rider would most likely want any chance to avoid an accident even if that means getting out of the way when necessary. If the driver put on his or her turn signal and the bike rider knows they are in a potential blind spot, it may be a good time to take evasive action including slowing down or stopping allow the truck to pass. Again, this does not mean the bike rider did not have right of way, but it is preferable to yield that right of way to avoid being hit by a truck making a right turn. Since many of these accidents involve large commercial vehicles like deliver trucks or semi-tractor trailers, is is helpful to understand there are some things that can prevent such accidents from occurring. While they are not required, as it may take a federal law to really accomplish this, having a truck with proper side guides can greatly reduce the number of fatalities and serious injuries that occur when a turning truck collides with a bike rider. There is a federal requirement for rear under ride prevention guards such as the red and white stripped bars suspended from the lower rear edge of large trailers, there is not such federal requirement for side guards. A side guard can come in various forms. It can either be a metal rail type construction like a guard rail that spans the gap between the wheels of a truck or trailer, or they can be a solid sheet of material. What complicates the matters is that some of these side guards are not really designed to handle impacts, but are rather an airflow director that may increase fuel mileage on trucks. The effectiveness of these aerodynamic side guards has not been proven, but they are becoming more popular. Proper safety side guards are designed to prevent bike riders and even cars from sliding under the trailer where they can get run over by the rear wheel as this often results in a fatality. While this will not prevent the actual impact from occurring, it will do a lot to prevent these often deadly under ride accidents.